When you are hitting out of sand, there are some important setup adjustments you want to make. First, widen your stance so it is slightly wider than shoulder width. This will give you more stability as you are swinging. You also want to lean your weight on your left or front foot. I recommend having 60% or more of your weight forward. Open your stance so your feet and body are aimed left and open your clubface so it's aimed to the right. The amount you open your stance and your clubface should match. I recommend leaning the shaft slightly forward and playing the ball forward in your stance. Also, try to bend a little more than you would on a normal full swing shot. If you watch the pros on TV when they hit out of bunkers, they usually get really low and have a lot of knee flex and good angles with their posture. It's generally good to make a full or 3 quarter backswing in the sand. The length of the follow through can change depending on how far you want the ball to carry. For a shorter bunker shot you may only have a half follow through. On a longer shot, a full backswing and a full follow through will work well. It's important to always accelerate through impact. You want to have enough clubhead speed so you can get through the sand. Try to hit down about 2 inches behind the ball and accelerate through. Some of the biggest problems I see with amatuer golfers out of sand are decelerating or getting too wristy. We never want to try to help the ball up in the air. Hitting down on the sand will allow you to use the bounce and loft of the club correctly. The wrists should stay firm through impact and in the follow through. Also, hanging back on your back or right foot will make it difficult to hit out of the sand correctly. To hit down on the sand, you need too keep your weight left. Try not to shift your weight with sand shots, just start with the weight left and keep it left thoughout the whole swing. Hope these tips help your sand game. 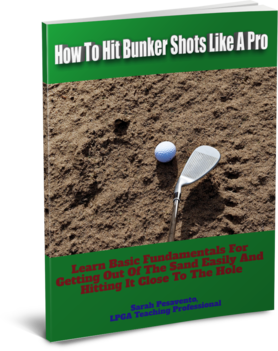 Once you practice the correct fundamentals, sand shots will become a lot easier and you'll have confidence knowing you can get it out and closer to the hole consistently.